Dog-Friendly Kill Devil Hills, NC Our week-long vacation at the Outer Banks would not be complete without a dog-friendly adventure at Kill Devil Hills. 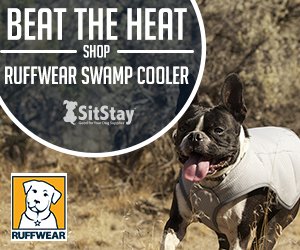 This was going to be a big day for Dexter The Dog and his puppy feet, so we packed the dog stroller. 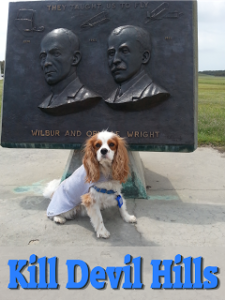 First up on our dog-friendly Kill Devil Hills day was The Wright Brothers’ National Memorial. The grounds are dog-friendly, but the inside of the Wright Brother’s Visitor Center was not. That didn’t matter; we had a great time! The family, including Dexter The Dog of course, walked the grounds. We were able to read and walk the Flight Line where there are four granite boulders that commemorated the take-off point for the first successful powered flight! We continued our walk to the living quarters and hangar that had been reconstructed at the original locations. Super neat, all the way down to the unique furnishings. What a hike! Ok, stroll. Onward we went to the Wright Brother’s Monument. 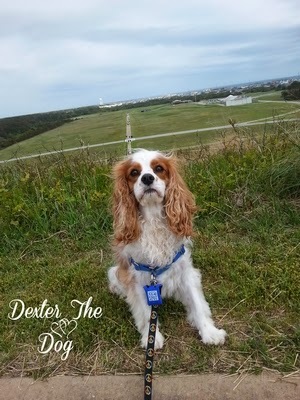 I know Dexter was happy to be in his dog stroller instead of having to make that hike all by himself. I don’t think his little feet would have made it up and back. Once again the Swift birds were swooping by us and Dexter was a bit excited to see them. It’s something about the way they way they fly and nose dive, that he just thinks they are the bomb! 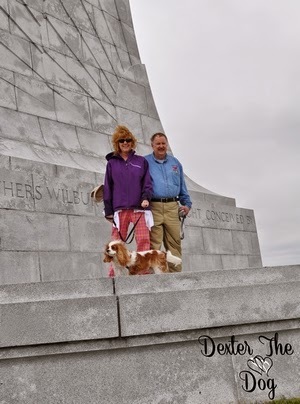 By the end of our trip to The Wright Brothers’ National Memorial, Dexter was beat and ready to go back to our dog-friendly rental home in Duck, NC. I think we all agreed. Have you visited Kill Devil Hills with your dog? Tell me in the comments.